Florida provides blue skies, clear weather and an excellent environment for post-secondary education. Its robust state university system and sprawling system of two-year schools provides tremendous choices. Options for degree seekers include famous names like the University of Florida and Florida State. Excellent private schools also abound, like Trinity Baptist College and Stetson University. Florida's community colleges and trade schools provide a fast track to any number of excellent professional opportunities. It's easy to get overwhelmed with so many choices and so much data. Fortunately, we have applied our rigorous methodology to the latest education data to rank the best colleges in Florida, including the top four-year and two-year schools. It pulls information from federal databases and includes acceptance, enrollment, and graduation rate. State data covers important things like student loan default rate. Florida features some of the most famous and best-ranked schools in the country, including the likes of the University of Florida, Florida State and the University of Miami. Students looking for a religious education pursue options like the Baptist College of Florida, the Hindu University of America and the Talmudic University of Florida to meet their spiritual needs. Aspiring creative professionals look to Fullsail University for training in video game design or film and television. Admission standards at famous schools can be rigorous. Florida State, for example, admits only 55% of students that apply. The average high school GPA for incoming FSU students is 3.92, as reported by Princeton Review, so academic excellence is required. Students in need of a more budget-friendly option should be careful. Funding troubles hit low-performance schools as part of the state's new performance-based funding scheme. This may mean reductions in state funding and financial aid for students in affected schools. With these factors in mind, review this year's finalized list of the best 4-year schools in Florida. Taking the top spot in our ranking of the best colleges in Florida is UF. Offering more than 300 different degree paths at the undergraduate and graduate level -- alongside 30 certificate programs -- the university ensures that every student has the chance to find their passion. Undergrad students choose from courses covering African-American studies, classics, medieval and early modern studies, and veterinary medical sciences, among others. UF students may choose to take part in the school's unique Innovation Academy, a 30-major program where every student gains a minor in innovation. The program, which was designed to give students a research-focused approach to business development, technology, and ethics, is particularly valuable to students considering an entrepreneurial path. Other colleges of note include the Schools of Agricultural and Life Sciences; Design, Construction and Planning; and Veterinary Medicine. With a small campus of just 2,000 students, USFSM's main focus is providing an individualized educational experience; the school boasts a student-to-faculty ratio of 13:1 and a 92% student satisfaction rate. The university currently has a catalog of 18 undergraduate majors, with over 25 minor options to choose from. Some of the school's standout programs include communication sciences and disorders, criminology, hospitality management, and interdisciplinary social sciences. Aside from more than 100 different internship opportunities available, undergraduates enrolled in the biology program get the rare opportunity to use the off-site labs at Mote Marine Laboratory, learn from leading scientists in their field, and develop practical experience through hands-on learning. Students on campus can also take advantage of the Florida Center for Partnerships for Arts-Integrated Teaching (PAInT), the Culinary Innovation Lab, service learning experiences, and study abroad opportunities. As one of the largest universities in our nation and the largest of all colleges in Florida, UCF in Orlando offers its 65,000 students 210 degree programs provided at the main campus, online, and through its 12 other regional locations. Representing students from every corner of America and 148 countries, the campus culture at UCF is diverse. The Carnegie Foundation has recognized UCF for excellence, bestowing the highest designations in both community engagement and very high research activity. Undergrads can choose from 109 different degrees, including a number offered in accelerated format for students looking to enter the job market quickly. A sampling of unique programs includes civil engineering, film, integrated business, and photonic science. To round out the student experience, UCF is currently home to more than 600 student clubs and organizations, including a meditation group, an advertising club, the Biomedical Engineering Society, and a thriving Greek life. Having met a rigorous number of benchmarks set forth by the Florida legislature, FSU in Tallahassee was recently designated as a preeminent research university. But that's not the only thing that makes FSU one of the best colleges in Florida. With a 93% freshman retention rate and a commitment to providing exceptional teaching opportunities -- including six Nobel Laureate faculty members -- students at FSU enjoy many features that aren't standard at most institutions. The school offers 160 undergraduate degrees through its 14 academic colleges, many of which are offered with additional specializations. For the undecided learner, advisors at FSU can help students sort through the wealth of options to find a program tailored to future goals. Aspirational students can also elect to participate in the honors program, Global FSU, or work with the Office of National Fellowships to find a scholarship to take part in exceptional programs, both domestic and abroad. Aside from being the only public research institution in Miami, FIU has several distinctive qualities that make it one of the best colleges in Florida. Designated by the Carnegie Foundation as having the Highest Research Activity, the institution also ranks first in the nation for awarding bachelor's degrees to Hispanic students. The Fulbright program recognized FIU as a Top Producer of U.S. Scholars for the 2015-2016 academic year, while the College of Law also maintains the top spot for passage rates on the Florida Bar Exam. As of 2017, the school offers nearly 200 degree programs at every academic level, with options for both campus and online study available. Some of the innovative programs offered by the school include Asian studies, construction management, Portuguese, and real estate. Students looking for an innovative marine biology program need look no further: FIU is home to the Aquarius Reef Base, the only underwater ocean laboratory in the world. Rounding out the top 10 best colleges in Florida is Tampa's USF, a major urban research institution with more than 60 years of history. Students with an interest in the sciences are often drawn to USF both for its record-breaking research funding and the fact that it ranks fourth in the world for American Association for the Advancement of Science fellowships. It's also a great choice for students pursuing careers in marine science, being one of only eight research centers in the world. USF currently has 226 undergraduate degree programs available through its 14 different colleges. These include the College of the Arts, the Muma College of Business, the College of Global Sustainability, and more. Students can choose to study areas such as behavioral healthcare, civil engineering, dance, global business, and Italian, among others. USF has a program to fit every student's goals, and learners can rest assured knowing qualified and respected faculty members will be there to guide them. 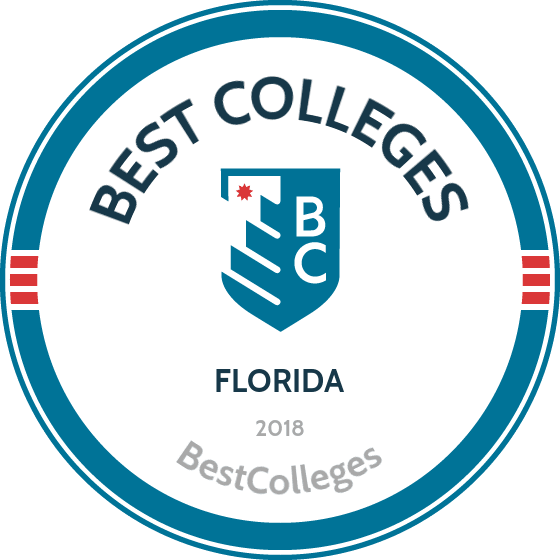 As the first private institution to appear on our list, BCF also has the distinction of being one of the handful of religious Florida colleges in this ranking. The college, which was founded during World War II, is today home to 18 undergraduate degrees divided between biblical and nonreligious topics. All degrees are taught through a Christian lens; students looking to work in the church can choose from programs such as ministry studies or missions with a concentration in aviation. Others may choose a more traditional degree like business leadership or secondary education. For those who are local to the Graceville campus, the college also has an innovative dual enrollment program for high school seniors looking to earn college credits. Outside of academics, BCF has a number of excellent services and resources available to students, including a wellness center, numerous student clubs, a career services department, and special married housing for couples attending the college together. As the name suggests, HSBC is one of the numerous Florida colleges in this ranking that prioritizes educating students through a Christian worldview. This institution sees its mission as preparing students to share the Good News, and the small roster of undergraduate degree programs reflects that approach. Students can select from programs in counseling, ministerial studies, missionary flight training, music/teacher education, or an innovative TESOL program for individuals looking to teach English abroad. The college also provides an intercultural studies program for those planning to serve as missionaries outside the United States. After arriving at the Hobe Sound campus, students can elect to take part in a ministry team such as Around the Sound, a traveling choir group. As part of its goal to make education widely accessible, the school places an emphasis on affordability. Financial aid is available in the form of scholarships, grants, loans, and on- and off-campus work. With numerous locations throughout the northwestern portion of the state, UWF rises above other Florida colleges by providing rigorous academics and an engaging community -- as recognized by the Carnegie Foundation. With a student body of 13,000 strong, most classes have less than 40 students and allow for an intimate learning experience. For active members of the military or veterans, UWF has been named a Gold-level Military Friendly School and applauded as one of the "Best for Vets" by Military Times. The university offers 45 undergraduate programs and 27 graduate degrees for those who may wish to continue their education. A sampling of unique degree options include athletic training, clinical laboratory sciences, global hospitality and tourism, and supply chain logistics management. Once a student reaches campus, they'll have the opportunity to be immersed in a range of campus life activities, including extracurricular clubs, intramural sports teams, student government, and Greek life. Hosting more than 30,000 students, FAU rounds out the top 25 best colleges in Florida. With more than 50 undergraduate degree programs, prospective students have the opportunity to pursue several degrees unique to the university, including exceptional student education, geomatics engineering, linguistics, and ocean engineering. Additionally, the school has a large number of combined degrees for students seeking both dual undergraduate degrees or the opportunity to complete a bachelor's and a master's degree in a shorter period of time. An example of one such offering is the B.S./M.S. accelerated program in biological sciences and environmental science. Students looking to supplement their degree can pursue one of several undergraduate certificates on offer, covering areas of study such as aging, geographic information studies, and women, gender, & sexuality studies. With more than 40 research centers on campus, students at FAU also have the rare opportunity to put their classroom learning to use in hands-on, real-world scenarios. As a research institution, students at the University of Miami can rest assured knowing they're learning from faculty members who are active in their fields while also having the opportunity to gain hands-on, practical knowledge. The university offers more than 115 undergraduate degree programs through its 11 schools and colleges; these include the School of Architecture, the College of Engineering, and the Frost School of Music. Unique degree options at UofM range from Africana studies and and neuroscience to Judaic studies and sport administration, and learners can choose to pursue dual degrees programs in biology, exercise physiology, marine geology, and more. Students also have the opportunity to enroll in one of the university's programs of distinction, including the Foot Fellows Honors Program, the da Vinci Program, or the Health Professions Mentoring Program, among others. The campus boasts 280 student organizations, 44 service groups, 26 intramural and sports clubs, a cinema, and an art museum. Located in Tampa, Altierus Career College is one of the best schools in Florida for practical skill development and earning real-world experience. Students can choose from seven diplomas and three associate degrees in fields like computer information technology; business; medical billing and coding; and heating, ventilation, and air conditioning. Graduates are prepared for jobs as medical assistants, electricians, and surgical technologists. Altierus also offers an eight-week, hybrid pharmacy technician diploma that combines on-campus classes with asynchronous coursework. Most programs begin every five weeks. Altierus operates on a open admission policy. The school does not require a minimum GPA or standardized test scores. Students enjoy small class sizes, state-of-the-art laboratories, and one-on-one academic and career guidance. The college also offers low tuition rates and financial aid opportunities, including awards such as the American Dream Scholarship. Founded in 1995, the University of Fort Lauderdale prepares students to become successful professionals and ethical community leaders. Undergraduate programs include ministry and business administration. Students can also choose a minor or specialization in areas such as Christian counseling, construction management, and healthcare administration. The school also offers master’s degrees in divinity and business administration. UFTL is distinct among schools in Florida for its focus on religious philosophies and ideals. The school boasts a high 86.5% retention rate and a 70% placement rate. Many of UFTL’s classes are available in an asynchronous online format. Online learners and on-campus students can receive academic support from the Learning Resource Center. Undergraduate applicants should have a minimum 2.0 GPA and graduate applicants should have a minimum 2.5 GPA. Undergraduate candidates should submit ACT or SAT scores. Students are eligible for financial aid, including several scholarship opportunities. New College has been building a name for itself in the 50 years since getting its start. With a current student body of 800, NCF is committed to providing a strong liberal arts education that prepares students for a range of careers. The school accomplishes this is by focusing exclusively on undergraduate education and maintaining a 10:1 student-to-faculty ratio. Designated by the Florida legislature as an "honors college for the liberal arts," NCF attracts students from far and wide. The school offers almost 40 areas of concentration (AOC), or majors, alongside an innovative program allowing aspirational learners to create their own interdisciplinary degree programs to meet unique goals. Students seeking an existing area of concentration can choose from three different divisions: humanities, social sciences, or natural sciences. Unique AOC options leading to a bachelor's degree include marine biology, medieval and renaissance studies, Russian language and literature, and more. As one of the best colleges in Florida for students in the upper portion of the state, UNF is consistently recognized by the U.S. Department of Education's College Scoreboard. In the most recent report, the agency gave UNF above average marks in annual cost, graduation rate, and average salary upon graduation. With five different colleges providing more than 100 different degree programs, UNF enjoys a diverse student body of future astrophysicists, professional harpists, historians, and civil engineers. The school also focuses on constantly enriching every student's experience and was recently applauded by the Carnegie Foundation for excellent community engagement. When they aren't in the classroom, students can take in a concert at the Lazzara Performance Hall, attend one of the 100+ student organization meetings, take advantage of the campus's 1,300 acres, or watch a baseball game at Harmon Stadium. Located in Panama City, Gulf Coast State College provides over 150 accessible academic programs. The school accommodates students seeking immediate job placement and students interested in further schooling. GCSC offers dozens of associate programs, including veterinary medicine, marine biology, and culinary management. Bachelor’s programs include digital media, organizational management, and nursing. The school also offers professional certificate programs for working professionals who want to advance their careers through skill-based and industry-specific training. Students can take individual classes in an asynchronous online format, or they can enroll in any one of the 13 fully remote certificate and degree programs. All students have access to internship and career development support. GCSC is recognized as a military friendly school. The college offers scholarships, evening courses, and online options to help military spouses advance their careers. Applicants who do not have recent SAT or ACT scores must take the Florida College Placement Test. As one of the Florida colleges taking part of in state university system, FGCU in Fort Myers has accomplished a lot in its 20-year history. With a student enrollment of nearly 15,000, the school continues to raise the bar of academic accomplishment with every entering class. The school offers 55 undergraduate degrees; some of the standout degrees include an accelerated biology program for motivated students, community health, music therapy, and PGA golf management. In order to help incoming freshmen find their footing, the school operates an extensive first year advising program as well as the opportunity for students to partake in peer mentoring. For students who enjoy extracurricular activities, the university is home to 15 Division I athletic teams, 20 fraternities and sororities, and nearly 200 student organizations. Based in Marianna, Chipola College specializes in career-focused, academic programs. Students pursuing an associate degree may major in areas such as English, mathematics, and exceptional student education. The school also offers seven bachelor’s degrees in education and teacher training, four programs in business administration, and an RN-to-BSN program. Chipola provides workforce programs in cosmetology, firefighting, welding, and other areas. Students can fulfill general education and prerequisite requirements at Chipola before completing their bachelor’s degree at a four-year school. Distance learning students can take certain courses in an asynchronous format. The school offers several scholarships, including an award for first generation and nursing students. The Career Resource Center helps students create a strong resume and search for job opportunities. Students may participate in service learning opportunities through the Take Stock In Children initiative. Based in Cocoa, Eastern Florida State College educates approximately 15,000 students each year. The school’s academic programs prepare learners to become effective professionals and civic leaders. EFSC offers certificates, diplomas, and undergraduate degrees. Associate programs include respiratory care and graphics technology, while bachelor’s programs include applied health sciences, computer information systems technology, and organizational management. Like many other schools in Florida, EFSC also offers an online RN-to-BSN program. The school's online offerings include more than 250 asynchronous courses. Certain certificate and degree programs are available entirely online, including the bachelor’s in organizational management. The school offers six entry dates every year. In-state students pay a lower tuition rate than their out-of-state peers. Students can access internships and other professional development opportunities through the Career Planning and Development Center. Students without recent SAT or ACT scores must complete a placement test. Ave Maria University is an authentically Catholic liberal arts institution providing an excellent education at the undergraduate and graduate levels. With approximately 1,100 students, Ave offers an intimate, modern campus setting and personalized education at an affordable price -- making it one of the best colleges in Florida for the cost-conscious learner. In fact, a large percentage of all students receive some type of financial aid. The university currently offers 34 undergraduate majors, with programs that range from Business to the Sciences to Humanities. Students at Ave Maria have access to a wide range of opportunities outside of the classroom including Mother Teresa Project service mission work, inter-collegiate, club and intramural athletics and numerous clubs. With over 200 events annually, Ave's students find excitement and entertainment that build the mind, spirit and body our vibrant campus. When Beacon College was established in 1989 by a group of visionary parents, the school set out with a very unique mission: to serve baccalaureate students who learn differently. As the first accredited undergraduate college in the nation exclusively devoted to this population, BC provides specialized learning opportunities for students with learning disabilities, attention-deficit hyperactivity disorder, and autism spectrum disorder. To fulfill that mission, every facet of campus life at this Florida college -- from application to graduation -- was developed to best serve these students' needs. The college currently consists of 285 students from 35 states and nine countries who take part in small classes. ACT/SAT scores aren't required, but students will need to have a documented learning difference. The school currently has seven different undergraduate degrees, ranging from anthrozoology to web and digital media. Several specializations and minors also available, including entrepreneurship, game design, and studio arts. Established in 1965 as one of the first regional colleges in Florida, the University of South Florida St. Petersburg provides academic programs that emphasize rigorous study, innovative research, and community partnerships. The school offers 35 bachelor's programs in areas like health sciences, world languages and cultures, and environmental science and policy. Concentration options enable students to craft a degree plan that suits their interests and goals. USFSP also offers graduate programs, including business administration, accountancy, conservation biology, liberal arts, and digital journalism and design. The school also offers eight graduate options in education and teacher training. Non-degree students can complete career-relevant certificate programs, which are available at the undergraduate and graduate levels. Students can earn their degree in a hybrid structure by mixing on-campus classes with asynchronous courses. Online classes are usually structured in an accelerated eight week format. The school also offers three fully online master’s programs. Located in Fort Pierce, Indian River State College has provided student-centered educational opportunities for more than 57 years. IRSC offers more than 100 academic programs, including applied diplomas, technical certificates, and undergraduate degrees. Options include associate tracks in occupational therapy, marine biology, and restaurant management, as well as bachelor’s degrees in business administration, nursing, and IT management and cybersecurity. Students can take some classes online or enroll in one of 12 fully-online programs. Most online courses are offered in an asynchronous format through the Blackboard learning platform. IRSC stands apart from other colleges in Florida for its low tuition rate. The U.S. Department of Education ranked IRSC as the third most affordable school in the country. Students are eligible for financial support such as institutional grants and scholarships. IRSC also provides academic advising, career services, and professional development opportunities. The school encourages students to join clubs, honor societies, and study abroad initiatives. Santa Fe College, located in Gainesville, Florida, was founded in 1965. The school offers associate, bachelor's, certificate, and technical programs. Santa Fe's AA degree is designed for students who plan to transfer to a different four-year school, such as the University of Florida. Bachelor's degree offerings include accounting, clinical laboratory science, health services administration, and industrial biotechnology. The school's only AAS program is in automotive service management technology. Santa Fe's bachelor's programs require students to earn 120 credits with a minimum 2.0 GPA. Santa Fe also offers online, hybrid, and web-enhanced courses, which allows students to complete their degrees in a hybrid format. Online courses are taught through the Canvas learning management system. Online student services include academic advising, a career resource center, tutoring, and access to the school library. Residents pay a lower, in-state tuition. Two-year college programs are a great way to save money on your education. They provide a sample of college life without taking the full plunge. Community colleges often have transfer agreements with four-year schools. This allows students to work on core and required courses for much cheaper tuition. For career-conscious students, community colleges also provide options for job training. This may include a two-year degree program or it can be a short certificate course. Some schools even offer on-the-job apprenticeship programs allowing students to start working right away. Florida's College System includes 28 colleges, 69 campuses and 178 sites across the state. Over 800,000 students attend a variety of courses. These include job training and professional certificates for those in need of a career. Others work on courses they need for a four-year degree. Some professionals find a continuing education course useful or even required. Florida features some of the top-scoring community colleges in the country, including Miami Dade College, Valencia College, and Broward College. You can find our detailed review of the top two-year programs in the state below. As one of the leading Florida community colleges, Immokalee Technical College offers a wide range of post-secondary career programs, including training in accounting, early childhood education, and heavy equipment mechanics. Located on a state-of-the-art campus in the city of Immokalee, iTech provides real world education for both traditional and distance learners towards gainful employment and career advancement. Immokalee gives students interested the option to pursue General Education Development (GED) coursework as well as classes for those who speak English as a second language. The school stands out among the best community colleges in Florida for its dedication to the service of seasonal and migrant farmworkers through its Farm Worker Career Development Program (FCDP). Lasting a few weeks to two years, the FCDP assists students with social development, skills training, and job searching. Free to those who qualify, graduates from the program largely move on to full-time gainful employment. Located in the city of Iverness, Withlacoochee Tech stands out as one of the best community colleges in Florida, offering innovative workplace-based career training programs for students as young as sixteen years old. Most programs take one school year to complete and students are graded on performance; students progress through the program as they demonstrate improvement in both skills and knowledge. Programs can be found in trade-oriented careers like air-conditioning/heating and welding technologies. Students looking to earn a bachelor's or master's can enroll in programs like nursing and network systems administration which they can transfer to four-year and graduate institutions in the state. WTI offers flexible programs where students can earn industry certification or state licensure. Learners at WTI can join one of its student organizations, like National Technical Honors Society or SkillUSA, providing the opportunity to network in their fields and gain access to funding and career opportunities. Depending on the program, high school students can earn up to 15 academic credits at universities and two year colleges in Florida while attending WTI. Pinellas Technical College provides programming in more than 40 areas through its campuses in Clearwater and St. Petersburg. The school emphasizes career and technical education, giving students the opportunity to acquire hands-on skills related to in-demand careers. While PTC does not award degrees, its courses transfer to degree-granting colleges; for example, PTC holds an articulation agreement with St. Petersburg College. Areas of study that can later be applied toward associate degrees include nursing, accounting operations, dental assisting, medical administration, and computer systems and information technology. One of the top schools in Florida for the technical trades, PTC offers apprenticeship programs in which students learn a trade under the guidance of an experienced worker in a field. Students can choose from several options, including plumbing, automotive technology, and industrial machinery maintenance. The school's comprehensive certificate programs also give students the opportunity to pick up skills in a compressed time frame. Established in 1962 to provide dedicated vocational training to Brandenton and surrounding areas, Manatee Technical College carries on that mission as one of the premiere Florida community colleges. The school services over 5,000 students annually. Manatee's academic catalog consists of courses focused on career preparation, continuing education, and general education development. MTC stands out among other technical or two year colleges in Florida by the number of career prep programs it offers, including 3-D animation, plumbing, and welding. Many MTC students experience fast entry-level career advancement, since most of their degree programs take less than one year to complete. The school participates in the Farmworkers Career Development Program. This program helps seasonal/migrant workers find full-time positions in nonagricultural fields, and specialized healthcare skill development through the MTC Community Center, a designated institution of the American Heart Association. Manatee provides enrichment classes in golf, Spanish, and household repairs (Handyman). Located in Palm Coast, Flagler Technical Institute provides students in the workforce career advancement opportunities through the learning of specific, marketable skills. Fields of learning include commercial vehicle driving, early childhood education, health science, and other programs. Each of these technical training programs can be personalized to fit the current experience and career objectives of individual students. Those interested in a career in agriculture can pursue a program in landscape and nursery management or water treatment technologies in order to build skills towards an immediate job, satisfy a training requirement of a current position, or as preparation towards a degree in one of the universities or two year colleges in Florida. Tuition is priced at $2.72 per instructional hour for state residents and $11.71 for non-residents, making FTI one of the best community colleges in Florida in terms of cost. FTI participates in the Step Up program, which helps adults with disabilities gain life skills and find employment. Marion Tech, located in downtown Ocala, serves over 3,000 students annually and is committed to lifelong learning and practical, career-based education. MTC offers career training programs and continuing education for professionals that rivals the best community colleges in Florida. The catalog includes programs in radiologic technology, applied cybersecurity, massage therapy, and phlebotomy, among many others. MTC is one of a few Florida community colleges to offer a combined firefighting and emergency medical technician program. The program is designed for students with no prior work experience in these fields to gain the knowledge and skills needed to enter either career tracks. Current professionals can find courses that teach advanced skills necessary for career advancement. Welders, for example, may take expert level courses in their field and thereby gain new skills or earn industry certification. Tuition is affordable and financial aid, including Veterans Educational Assistance, is available. Charlotte Technical College has a history dating back to 1978. The school's philosophy is concurrent with some of the best community colleges in Florida: the education of nontraditional learners in trade career and other vocational fields. CTC offers many nationally and regionally accredited career training programs, including courses in the fields of health science, information technology, architecture and construction, and hospitality and tourism. A variety of programs are offered at night to accommodate busy work schedules. Professionals have the option to pursue continued education courses, in IV therapy and construction maintenance techniques, towards the advancement of their careers. CTC stands out among Florida colleges for its dual education option for high school students, wherein they can get a head-start in their career by taking courses at the college while still being able to graduate from their high school. State residents pay a much lower tuition price, but the cost is affordable for out-of-state students. Lorenzo Walker Technical College is located in the city of Naples and is one of the best community colleges in Florida, offering job training and accreditation in a variety of fields. Among LWTC's catalog are certification programs in medical assisting, welding technology, phlebotomy, account operations, and many others. The school stands out as one of a few community and two year colleges in Florida to offer training in aircraft airframe and powerplant mechanics. Students learn key skills in working with commercial aviation maintenance and repair, and graduate ready to sit for the Federal Aviation Administration exams. Most programs are offered in the daytime and at night, and a selection of courses are offered online through the ed2go portal, enabling students to pursue their career goals while juggling busy personal and professional obligations. Lorenzo Walker is among the most affordable of Florida community colleges. Florida Panhandle Tech's mission is firmly rooted in competent technical education for employment and advancement in vocational careers. Located in the city of Chipley, FPTC offers a large number of certificate degrees, including programs in law/corrections, applied information technology, pharmacy technology, and high school and general education development. FPTC is one of the few vocational or two year colleges in Florida to offer career training in woodworking, specifically cabinetmaking and carpentry. These programs teach fundamental skills for the woodworking profession and enable graduates to sit for the National Center for Construction Education Research professional exam. Students with the carpentry certificate may apply their coursework towards the completion of their associate's degree in building construction technology at other Florida community colleges and universities. FPTC is one of the best community colleges in Florida in terms of cost and quality of education. George Stone Tech, named after the former Florida legislature whose bill helped build vocational schools throughout the state, is located in Pensacola. George Stone offers a large catalog of career and technical training programs, including degrees in aviation maintenance, home health aide, and commercial foods & culinary arts, all of which prepare students for certification in their respective fields. The school has General Education Development courses, but the center stands out for its co-enrollment options for nontraditional high school-aged students who wish to graduate with their cohort group. GSTC is one of the best community colleges in Florida for studying criminal justice. The degree prepares students for careers in law enforcement and correctional systems. There are no "crossover" options; a current police officer cannot easily transition into correctional work and vice-versa. All applicants to GSTC must pass an entrance exam. Prospective, current, and former students are all qualified to receive personal counseling. Big Bend Technical College, located in the city of Perry, is accredited by the Council on Occupational Education and is dedicated to providing flexible and affordable workforce education. BBTC offers full-time career and technical programs in the fields of office administration, patient care, electrical technologies, among other programs. The school stands out among other Florida community colleges for its millwright programs, teaching students the skills necessary to maintain and repair industrial machinery. The institute's millwright program has a high success rate as graduates usually move directly into careers as plant/factory mechanics and installers, making it one of the best community colleges in Florida for this type of work. BBTC also offers a number of continuing and general education development courses. Tuition is paid per hour and based on the student's residency status. BBTC offers veteran assistance, by offering tuition reduction or remission, and accepting program credits for previous military training. North Florida, located in Madison, is dedicated to individualized and accessible education. The school boasts one of the most affordable tuitions among Florida community colleges--a rate they have not increased in the past three years. NFCC offers many associate's degrees, certificates, and nondegree programs. Students can earn their Associate in Science or Associate in Arts at NFCC, with several majors and areas of emphasis within each degree, including Emergency Medical Services and STEM. In addition, the A.A. degree allows students to enter an articulation agreement with schools in the Florida College System. This "2+2" program means that students complete their first two years of a bachelor's at NFCC, and are then guaranteed admission to a Florida university to complete the remaining two. All of these opportunities make NFCC one of the best community colleges in Florida, whether students are seeking immediate job placement after graduation or continued education. Emerald Coast Tech, located in DeFuniak Springs, is one of the Florida community colleges dedicated to providing affordable education to all students. The school provides career training, postsecondary accreditation, and adult enrichment. Emerald Coast offers degree programs in the in the fields of information technology, automotive service, construction, cosmetology, and nursing and health science. Short term classes are available and designed as a service to local businesses and other members of the community, making ECTC one of the best community colleges in Florida for customized skills training. Most programs have four points of entry during the year, allowing students to enroll when it suits them. Tuition rate is based on residency status, and though ECTC is not currently participating in federal loans or federal work-study programs, other forms of private, local, and state financial aid is available. Applicants must pass entry exams (the TABE or the TEAS for nursing programs). The Technical Education Center, known for their "career in a year" job training programs, has its main campus in the city of Kissimee. As one of the Florida community colleges with vocational training programs, TECO offers courses in digital design, medical administration, pharmacy technology, and culinary arts. Though the school does not offer associate's degrees, many of TECO's job training programs allow students to gain credits towards their work at two year colleges in Florida, in particular, at Valencia College in Orlando. TECO boasts a criminal justice program that rivals the best community colleges in Florida. The program teaches new and seasoned students new skills that lead towards career advancement.Tuition is based on program, but financial aid is available to everyone, including federal grants and state-specific awards like the Florida Bright Futures Scholarships. TECO students get access to student services, including career counseling, academic tutoring, and the ability to join the National Technical Honors Society for networking and other opportunities. Established in 1963, Orange Technical College’s mid-Florida campus is one of five campuses in the OTC system. While the school does not grant associate degrees, an articulation agreement with Valencia College makes it easy for students to transfer certificates or credits toward an associate of science degree. Articulated programs include 3D animation technology, advanced automotive technology, emergency medical technician, and enterprise desktop and mobile support technology. OTC is one of the most technically advanced training schools in Florida. The mid-Florida campus houses four adult training centers and six service centers, providing students with opportunities for apprenticeship-based training. Students engage in apprenticeships in various fields, working with plumbers, masons, electricians, and industrial pipefitters. These apprenticeship certifications lead to the title of journeyman. The mission of Riveroak Technical College, located in Live Oak, is to provide students of all ages and backgrounds with opportunities to enter or advance in the career of their choosing, while imbuing them with life skills that lead to self-confidence and sufficiency. RTC offers a variety of career programs, training students to be pharmacy technicians, cosmetologists, welding technicians, and auto-collision specialists, among other specialized jobs. Riveroak is one of the few Florida community colleges to offer courses in brick and block masonry, from planning and creation to installation and maintenance. Accredited by the National Center for Construction Education and Research (NCCER), students leave the program ready for industry certification. RTC offers community and adult education courses that help students get their high school diploma, gain academic and life skills, or prepare students for job training programs at Riveroak and other institutions. Bradford-Union Technical Center, located in the city of Starke, specializes in career and technical education programming. The school does not offer associate degree programs but gives students the opportunity to earn the credentials necessary for entry-level vocations. Plans of study include many options in the health science field with courses that cover medical assisting and practical nursing, among others. Students interested in careers in transportation, distribution, and/or logistics elect to take courses in automotive service technology, commercial vehicle driving, and automotive maintenance. In the computer systems and information technology program, students prepare for the CompTIA A+, Security+, and Network+ industry certifications by taking a sequence of courses. Bradford-Union Technical Center also ranks as one of the best community colleges in Florida for adult education. The school provides courses in adult basic education leading to a GED certificate, adult secondary education to help individuals complete a high school diploma, and community education on various topics. The school also offers remediation programs and helps students transfer to other schools. With several career and technical programs, Lindsey Hopkins Technical College gives learners the opportunity to begin a new career or sharpen/update their skills. While the Miami-based school does not offer associate degrees, individuals can earn credentials for work-readiness in a matter of weeks. Plans of study incorporate academic, vocational, and employability skills such as interpersonal communication. Plans of study include automotive technology, dental assisting, practical nursing, and early childhood education. The school's innovative marine service technology program prepares marine riggers as well as outboard engine, drivetrain, and inboard gas engine technicians. As a part of its hospitality and tourism career cluster, the dietetic management and supervision program immerses students in the study of nutrition, food quality, equipment and supplies, and personnel management. One of the best schools in Florida for adult education, individuals can also enroll in GED, ESOL, and refugee retraining programs. Terms at LHTC begin in late January, April, and August, and the college features an open enrollment policy. William T. McFatter Technical College serves residents of Broward County in southeast Florida. The school administers a comprehensive suite of occupational certificate programs. Students complete plans of study over 12 months in areas that include accounting, early childhood education, digital media technology, medical assisting, and legal administration. One of the best schools in Florida for training in the trades, MTC offers certificate programs in welding, drafting, automotive collision, and marine service technology. The school also has career placement services that help students ages 18-21, who have mild to moderate disabilities, transition into careers. Individuals identify their career options, develop and improve their work-related behavior, and secure the industry credentials necessary to secure employment. MTC also offers adult education programming that covers GED prep, Applied Academics for Adult Education, and Adult Basic Education. Additionally, its ESOL program enrolls learners who do not speak English as a first language. Students may need to complete the ABE track to gain admission into some of the programs at MTC. Fort Myers Tech offers several career-training programs that help students prepare for industry certification/licensure and obtain lucrative positions upon graduation. FMTC's catalog includes education in architecture and construction, hospitality, and manufacturing, including other programs. Like some of the best community colleges in Florida, FMTC offers completely online programs in medical coding and cybersecurity, including short-term skill development classes that helps working professional gain an edge in their field. FMTC is dedicated to helping adult learners and offers remediation courses through their Learning Center to help students prepare for their full-time programs. Students usually finish in less than two years and tuition is based on state residency status. FMTC has a dedicated scholarship initiative and provides many internal and external opportunities. It's largely funded by the school's network of dedicated supporters and alumni, making it a stand-out among other two year colleges in Florida. Established in 1993 and located in Tampa, Fred D. Learey Tech is one of the Florida community colleges offering both degree as well as career development courses. Its course catalog contains technical training programs in automotive service technology, emergency medical technologies, and early childhood education. LTC is one of the few two year colleges in Florida to offer a degree program for prospective firefighters with level I and II comprehensive training. The degree is designed to meet the Florida Bureau of Fire Standards requirements and prepares graduates to train and test for State Certification. Tuition ranges widely by program and course, but the net price averages $2,054 per year. All applicants must take the Test of Adult Basic education (TABE) to show that the have the prerequisite academic skills. As one of the best community colleges in Florida for military, veterans and their spouses are welcomed to apply for Veterans Administration educational benefits, which include additional funding and tuition remission. Marchman Tech, located in New Port Richey, stands out among Florida community colleges for its dedication to workforce training and adult education. The school offers 12 career programs in addition to coursework for General Education Development, non-native English speakers, and Adults with Disabilities. Technical training includes programs in marine service technology, digital cinema production, and electrical maintenance. MTC is one of the two year colleges in Florida to offer cosmetology and automotive service/collision courses at night, allowing students to pursue the degree while maintaining a full-time job or other obligations. Marchman is one of the best community colleges in Florida for current high school students because it offers options to pursue dual-enrollment and technical training while completing a secondary degree. Learners may opt for the Transition Education Program, which helps high school students get work experience and gain life skills, ensuring a successful move into working adult life. Tuition is based on residency status. With three locations in Broward County, Sheridan Technical College provides career and technical preparation for individuals living in southeast Florida. Most STC students take courses on the school's 18-acre main campus in Hollywood and complete programs in less than a year of full-time study. Learners can select from business programs with concentrations in accounting, administrative office assistant, and business management. STC also prepares tradespeople through programs in plumbing; electricity; carpentry; and air conditioning, refrigeration, and heating. STC represents one of the best schools in Florida for automotive technology coursework; its campus in Pembroke houses the school's auto service tech program and workforce development programs in commercial class B driving, commercial vehicle driving, and bus and truck technical training. Students can enroll at STC on a full-time or part-time basis. Individuals can also opt to remediate academic and skill deficiencies through Adult Basic Education and GED preparation programs. Erwin Tech, part of the Hillsborough County Public Schools system, is a Florida community college in the city of Tampa offering full-time career training programs. ETC's catalog consists of programs in the fields of business, design, industrial services, and medical technology. Both day-time and evening classes are provided, allowing students to pursue career development at their own pace and based on their work schedules or other obligations. ETC stands out among other technical schools and two year colleges in Florida for its barbering program. Offered at the standard and expert levels, students master necessary skills, get assistance with job placement, and graduate the program ready to take the Florida State Board of Barbers Examination. ETC also offers part-time classes for specific skill development in areas like payroll accounting, electrical wiring, and woodworking, which enables working professionals to hone their skills toward better-paying positions. The low price of ETC's programs makes it among the best community colleges in Florida, and financial aid is available to full-time students. ATC offers programs that specialize in preparing students to pursue high-wage, high-demand fields in the region. The school, located in Coconut Creek, administers programs in career and technical education that lead to diplomas and certificates. Students can earn nationally-recognized certificates in one year in a wide range of areas such as accounting operations, business management and analysis, dental assisting, and applied information technology. ATC is one of the top community colleges in Florida in terms of hands-on career preparation. Students can participate in cooperative training opportunities via apprenticeships. ATC boasts the largest apprenticeship training program in Florida, which allows students to receive pay during 40-hour on-the-job training conducted under the supervision of a journeyperson. Areas of study include masonry, carpentry, electrician, machining, and surveying and mapping technology. Upon completion, students can transfer all credits to Broward College and earn an associate of science degree. Admission requirements include a high school diploma or GED, or passing the Tests of Adult Basic Education. If you're thinking about applying to one of the best colleges in Florida, continuing reading to learn more about living in the Sunshine State. Florida is famous for blue skies, surf and sun. The state covers 5,860 square miles (1,198 miles of coastline) and packs almost 20 million people into that small space. In fact, it's the fourth most-populated state in the country. Geographers divide Florida into four regions. These include the Gulf Coast and coastal plains (those beaches you've heard so much about). In the northern part of the state lie the hilly upland areas. Alligators and wildlife abound in the famously swampy Everglades. Finally, explore an island paradise in the Jimmy Buffet-approved Florida Keys. Florida's stellar universities offer real opportunities for students. But the college and university system have stringent requirements for students that want resident status. It's best for students to plan as soon as possible, even if they don't intend to go to college for a while. For minors, the first big determination is whether they are an independent or dependent student. The university makes its decision based on the student and parents' tax returns. Other documentation may be needed, as no one piece is necessarily conclusive. Students and their parents have to prove that they live in Florida for reasons beyond just attending school. To do that, the school may want proof they've made a life in the state. This includes documents like driver's license and voter registration cards. It can also include proof of home ownership and proof of full-time employment. The school bases its decision on the student and their parent or legal guardian living in the state for a year before seeking resident status. Adults must live in Florida for reasons beyond just attending school. Proving this can involve documentation of a life outside education. The university may want home ownership papers. Government documents like a driver's license or voter's registration may also serve to prove residency. The school may also want to see proof of full-time employment. No single document is conclusive and the school is the final arbiter of its decision.